Watch Bon Scott and AC/DC introduce "Highway to Hell" to America in 1979. Forty years ago Tuesday, Atlantic Records released AC/DC’s Let There Be Rock, the album that would ultimately save the Australian rockers from the cut-out bins of rock ‘n’ roll obscurity. And what better way to commemorate the release than with some incredible content from the Paste Vault? Today we’ve uncovered rare live footage of the band with the legendary Bon Scott at the controls as the lead singer and frontman. Shortly after this 1979 tour, Scott would be dead of alcohol poisoning at age 33. Let There Be Rock was AC/DC’s fourth proper release, and while it barely charted in the U.S., it sold just well enough for the band to be able to tour America for the first time. And as fans know, it also produced several tour staples that remained in the band’s setlists right up until Scott’s replacement, Brian Johnson, retired in 2016 due to hearing loss. Bon Scott’s yelps and Angus Young’s solo on “Highway to Hell” iconic rock ‘n’ roll perfectly delivered, and you can see the joy in Scott and his bandmates in unveiling this soon-to-be classic. Even on these classic recordings, one can’t help but compare Scott to Johnson, rock’s all-time scream king. Scott has far more range but is not really a natural singer, either. But he was a natural showman. At Day on the Green, the crowd—most of whom are presumably there to see their American heroes, Aerosmith and Ted Nugent—seems only moderately interested in “Dog Eat Dog” during the long windup, but snaps to attention when they finally recognize the song. The shirtless Scott exhibits classic rock posturing. His voice certainly doesn’t lose anything live. And the Bo Diddley riff is neatly revealed amid all the semi-organized chaos. If “Problem Child” highlights anything about AC/DC, it’s Scott’s impossibly tight jeans. 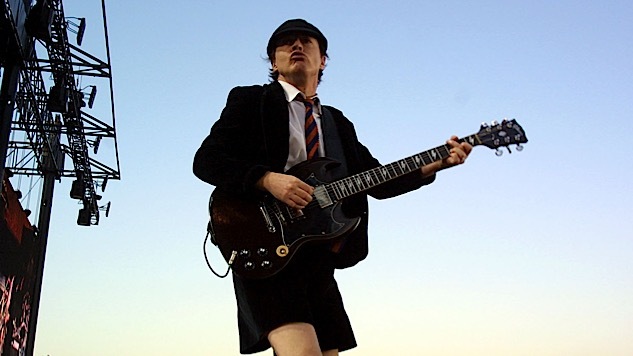 The group has boundless energy onstage, propelled by the hyper-kinetic Angus Young appropriately dressed as a (tireless) child. Young and Scott play off one another nicely, and the American crowd is won over by the end of the song. “Bad Boy Boogie” is a hard-rock jam with a one-minute windup in which Young shows off some guitar histrionics that could rival Nugent’s. After it kicks in hard and fast, the irrepressible Young gets an extended showcase at about 4:30, walking around the stage on his knees. Last but obviously not least, a new song for the band, “Highway to Hell”, shows that Scott would have excelled with the Back in Black material that followed and propelled the group to new heights after his death in 1980. If you want to compare Scott’s scream to the man who would follow him on Back in Black, see 2:49 mark of the track. Scott announces the album would come out the next month, and the crowd immediately responds to the iconic staccato riff that remains the band’s trademark. The “Don’t you stop me!” (2:10), followed by Scott’s yelps and Young’s solo is iconic rock ‘n’ roll perfectly delivered, and you can see the joy in Scott and his bandmates in unveiling this soon-to-be classic. The Highway to Hell album was released on July 27, 1979. Scott died on Feb. 19, 1980.